Iestyn Harris, the new head coach of Salford, has confirmed he is no longer in charge of the Wales national team. 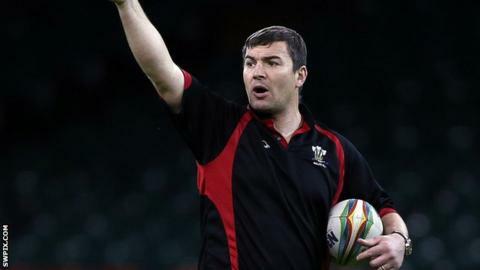 Harris, a dual-code international, had been in charge of Wales since 2009 and led them at the 2013 World Cup, where they lost all three group matches. The 37-year-old has replaced Brian Noble at Salford, agreeing a contract until the end of the 2016 season. Red Devils owner Marwan Koukash says Noble has until Friday to decide if he wants to stay in an alternative role. The former Great Britain coach has been offered the post of director of football but Koukash admitted to BBC Radio Manchester that he does not think the 53-year-old will accept. "This is a genuine job and will be a genuine vacancy," he said. "If it's not going to be Brian, it's going to be somebody else. "We've got other options, but I would love Brian to have a go at this and see whether he will like it. If Brian, for any reason, doesn't want to be part of this club, that's his choice. "Despite repeated attempts by me to contact Brian, he has not spoken to me since Friday. I think he's spoken to [chief executive] Martin Vickers and probably made it clear that he's not interested in the role. "On Friday at 5pm, if I do not hear and the job is not filled by Brian, I will be looking elsewhere." Harris was initially approached by Salford last month and it was thought he would become part of Noble's staff. The pair previously worked together at Crusaders and Harris hopes their friendship will not be affected by recent events. "What you want to try to do is separate professional and personal relationships as best you can," said the former Wigan Warriors assistant coach. "It's always difficult. I class Brian as a friend and I think I've acted in a way that would still allow us to have that friendship. I hope he feels the same way." Meanwhile, Sean Long has been offered a full-time contract with the club after working as a coaching consultant, and they have also submitted a visa application for Shane Flanagan, who they hope will join their backroom staff. Flanagan, the coach of NRL side Cronulla Sharks, is currently serving a 12-month ban after he was found to have failed Cronulla's players in regards to safeguarding their health and welfare during the 2011 season. The ban only applies in the NRL and does not prevent him from working for the Super League side on a short-term basis.